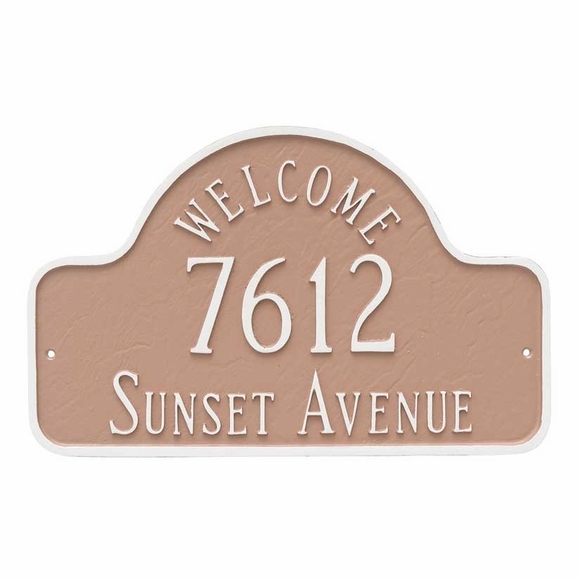 Welcome Arch Estate Size Address Plaque - - personalized two-line address sign with the word WELCOME integrated into the decorative arch above the house number. Wall mount or lawn (price includes two lawn stakes). Made in USA. The word WELCOME is part of this plaque and is not included as a personalization option. 24"W x 15"H estate size sign holds up to five 4" numbers on Line 1 and up to seventeen (17) characters on Line 2. Estate size WELCOME arch plaque personalized with your address. Comes in 26 different color combinations. Made in the USA.